or view our short video. 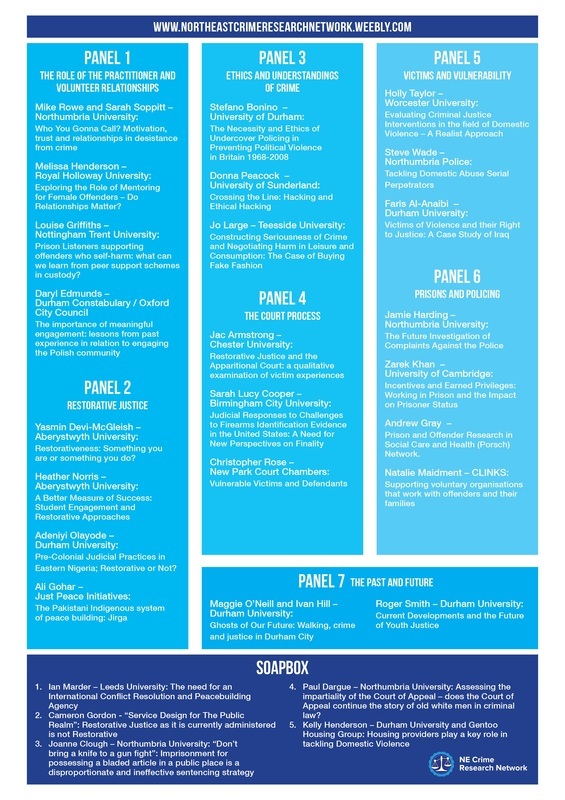 Programme for the North East Crime Research Network Conference, 3rd November 2014 Collingwood College, Durham University. The conference will start at 9am (first speakers at 9.30am) and close at 5.30pm. At the end of the conference Prof. Maggie O'Neill and Dr. Ivan Hill (Durham University School of Applied Social Sciences) will lead a crime, punishment and justice walking tour connecting history and the present, education, church and state, crimes of poverty with murder and mystery. The walk will last approximately 2 hours. The walk will take us to the centre of Durham City and will be followed by informal drinks and dinner. Registration to attend the conference will close at midnight Sunday 19th October. We would like to thank Durham University PhD Student Projects and Initiatives Grant Scheme for helping to fund this event and SAGE publications for sponsoring the Soapbox Session prizes.